Your pet is a part of your family and losing them can be emotionally devastating. If you or someone you know recently lost a canine companion, we offer you our most sincere condolences. We’ve been there and understand the pain you are feeling right now. Here are some additional strategies and insights to help you work through this difficult time. Everyone deals with grief in different ways. Strong initial emotions my preclude the inevitable sadness that comes when the shock is gone. These reactions are often taken out on those closest to the one experiencing the loss, and act almost as a means of protection for that person until they are able to face the truth. While grieving is a very individual and personal thing, there comes a time for us all when it’s best to stop feeling the loss and to actively choose to move past it. The right time for you, will not necessarily be the same as someone else. Depending on how long it takes you to move through denial and get to acceptance, it could take weeks or it could take years for you to become ready to deal with your grief. When you are ready, however, you don’t have to face it alone. If sitting down for a one-on-one with an actual counselor, or even getting up the nerve to attend a local support group proves too much at this point in your process, Tufts University Cummings School of Veterinary medicine offers a toll-free, Pet Loss Support Hotline for grieving parties. We have also recently set up a Pet Loss Support in our community that may prove helpful. While outside support is an important tool for coping with your grief, there are some things that a support group can’t do for you… you have to do them for yourself. Acknowledge your sadness, embrace it, and give yourself permission to feel and express this pain! It’s a vital part of the healing process. Write out your feelings. Whether it’s in a personal journal or an essay on Fido that you submit for publication, writing is extremely cathartic. 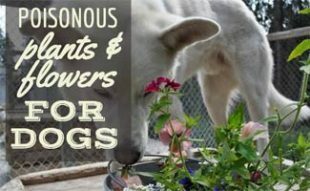 Volunteer with a local animal shelter. While this may be best left for the later stages of grief, just like helping other people helps you forget your own problems, helping other animals will help you move past your loss. 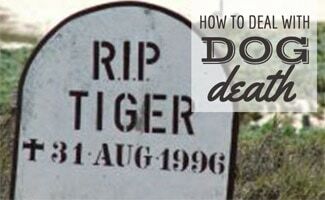 Prepare a memorial for your pet. 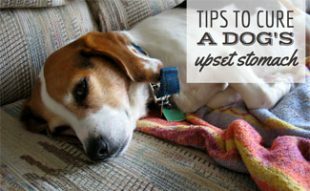 The act of having a service, saying a few words, and laying your pup to rest will definitely help give you the closure you need. Beyond your grief lies reality: Whether you’re having to make the tough decision to euthanize your sick or aging pet, or if your pet is already gone and you’re having to deal with the memorial, and burial or cremation arrangements, the reality of these situations can come crashing down on you like a ton of bricks. This can leave you feeling overwhelmed and unsure of where to turn. We’ll walk you through these separate scenarios so you can confidently cope with whatever comes your way throughout the process. As your pet ages, or in the event that your otherwise healthy pup should become unexplainably ill or injured beyond recovery, it may be necessary to become emotionally prepared to euthanize your pet. From knowing when it’s time, how to say goodbye and what to expect next, our article on Dog Euthanasia will walk you through this difficult process so you don’t have to do it alone. Whether your dog’s death was of natural causes, or you were forced to make that tough decision yourself to end his or her pain and suffering, once your dog has passed comes the matter of cremation or burial. Our article on dog cremation and burial offers information on the process of dealing with the remains, and options for memorializing your pet after death. Don’t forget: The best way to honor your pet, your four-legged family member, is to remember the good times you had together and to be grateful that you were given the valuable time you had. Gratefulness goes a long way in the healing process, and helps us remember that, despite the heartache when our sweet ones pass on, that it was worth it… and that one day, it will be worth it again. 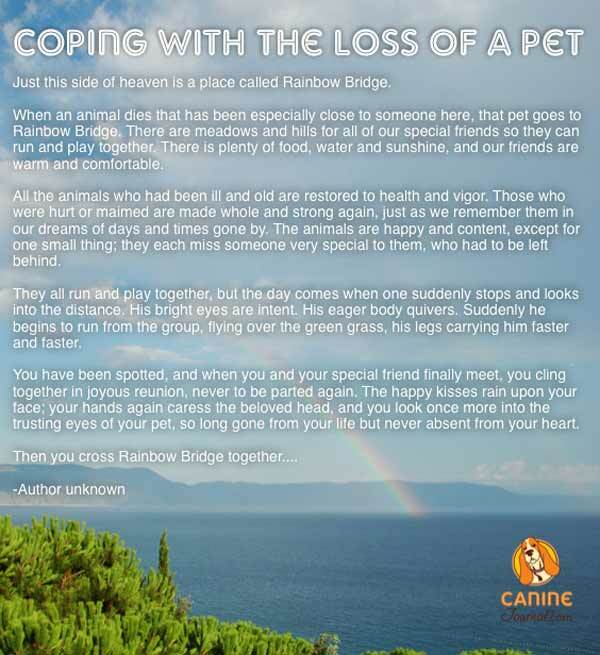 Whether you are dealing with the loss of a pet yourself or helping a loved one manage their pain, the Rainbow Bridge is always a nice story to share your sympathy in a very empathetic and caring way. Discussing and sharing stories of your pet after losing them one way to begin the healing process. We welcome you to leave memories of your dog in our comments below or our dedicated Pet Loss Support community topic. Another sweet idea to create a dog gift or book with their photo to remember them by. Looking back through old photos also assist in the memories you cherished together. How will you remember your pet? I am so sorry, Will. I can’t imagine what you are going through. You are in my thoughts. My 10 year old Yorkie Lola passed away this morning and I am completely devastated. She was my soulmate, my baby girl, my everything.. She started with a mass on her neck a month ago her vet put her on antibiotic because he thought it may be an infection, after 2 weeks the mass grew, he scheduled a biopsy along with dental work, the time of her biopsy we were informed that she was severely anemic and they could not do she was too fragile immediately took her to cancer/surgeon specialist & was told she had an aggressive cancer and nothing could be done the risk was too high.. This happened so fast, she never had any issues. I was so stressed out and my emotional level was all over the place thinking about how I was going to have to take her in to put her to sleep was so emotionally draining up until 2 days ago she was still eating, drinking, walking etc. Yesterday she stopped getting up she was so fragile I fed her in her bed and she ate and drank her water she had enough strength to go potty. We made the decision to put her to sleep but she spared me the pain and passed away in her sleep this morning. That is the connection we had, she fought to keep me from suffering & I fought to keep her alive.. I was selfish, my baby was not! Now I don’t even know who I am without her. I want her here with me, I know if there is such a thing that she will find her way back to me somehow.. The connection we had was amazing, and even if she doesn’t in this life I know I will see her in heaven and will never have to let go of her. But until then I will miss her the rest of my life.. I am heartbroken beyond repair. I am so sorry for your loss, you are in my thoughts. We just put down our 16 year old Lhasa, and was a tough decision. I felt if we would have removed the stomach tumor we may have prolonged his life, but he didn’t respond well to pre antibiotics, was already nearly totally blind and hard of hearing, and walked slow. He had some life in him but really diminished. Maybe it’s better for him long term, but I have some feeling of guilt. We feel blessed we had him over 16 years though. Sorry for your lost. I just put down my 11 year old Lhasa. Saddest day of my life. I held him as he went away on my arms. He looked so peaceful, his eyes were open; he looked as if he was still alive. Hi I just about to out my dog to sleep its killing me I dont know what to do. I’m so sorry, you are in my thoughts. We just put our cockapoo, Patches, to sleep on Saturday, March 30, 2019. It was his 11th birthday. He was also diabetic; he was diagnosed with it around October 2018. He went blind within 2 weeks. The vets managed it well, until he got inflammation in his eyes and got uveitis. The only drops that would help were steroids which raised his blood sugar. Fast forward to Thursday, March 28th. Patches was restless and in a lot of pain so we took him to the vet. He also suffered from severe arthritis as well as painful disks in his neck and back. The vet said that there was a disk in his back that would eventually push up into his spine cutting off bloodflow which would eventually cause him to become paralysed. The only thing that they could give us was tramadol and a muscle relaxer. When we got home he wouldn’t eat so we couldn’t give him his insulin. Then the next day we took him back to the vet because he refused to eat, drink, or move, and he was struggling to go to the bathroom. They gave us all of the information that they had but said that he would never recover from this. We took him back home and he ate some food and took his medicines. The next day, Saturday, was his 11th birthday. We had an appointment with the vet at 3:30 for a follow-up and he told us that he’d give us a call in the morning to see how Patches was doing. When he called, we told him that we decided to put him to sleep and that we would keep the appointment. We made his birthday and last day very special by taking him for a walk in his stroller and giving him whatever he wanted to eat. We didn’t bother him to put in his 4 eye drops or give him his bitter pain meds that he always hated. My boyfriend played the guitar for him and he fell asleep. He loved listening to music. Then at 2:45 we left to go to the vet and stayed with him through the end. I held him in my arms and on my lap as he took his last breaths and I wouldn’t have wanted it any other way. I miss him so much and I don’t know how I’m going to get through all of this pain. I feel like a part of me is missing. I feel so alone and broken and I don’t see things ever getting better. Yesterday we put down our sweet Gracie, a 16.5 year old black and white cocker. She was small for a cocker, usually 19-24 pounds depending on her health at the time. We are heartbroken, though we knew it was time. Overall she was doing well until Friday. 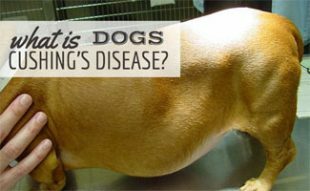 She stopped eating, started having seizures, and was breathing very shallow but forceful. 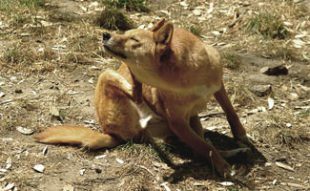 She received the best vet care throughout her life as she contracted an extremely bizarre and fatal fungal infection in 2011. My vet would not accept the dire prognosis, and after consulting with vet schools across the country, and continuously adjusting human meds for over a year, Gracie beat the odds, and had a healthy life for the next eight years. Her organs just wore out, but her personality was there to the end. My compassionate vet came to our home yesterday and gently put our baby to rest. I truly believe my baby is in Heaven with our other fur kids, and I will see her again. When my mom died many years ago, I decided to use the mourning dove as a connection between myself and my mom in Heaven. After we took Gracie’s body to the vet to be prepped for cremation, I went to stand on my deck just to breathe deeply and grieve. There next to the door on the deck was a mourning dove’s feather. I am so sorry, you are in my thoughts. My dog, Marvin got cancer 2 months ago, and it got worse and worse and today i had to put him down. when we were walking to the car he got a rush of adrenaline and he was back to his old self. he was playful and happy just like he used to be before he got the tumor. all of the sudden that was taken away when i was forced to put him down. this is the first time i have ever put a dog down. i feel horrible and i really want him back. i need serious help dealing with this emotionally. I’m so used to him being there. I’m so sorry. Perhaps seeing a professional about how you are feeling may help you grieve your loss? You are in my thoughts. Nolan, I know exactly what you are going through. I had to put my dog down on Friday as well. He was 9 years old but acted like he was 2. Hershey was my first dog. We discovered that he had cancer that same morning and everyone told us that we should euthanise because surgery was not an option. I felt my heart drop when I heard that. I haven’t been able to stop crying since. Just know that you made the right decision for your dog considering the circumstances. I have to remind myself that every so often.Take your time to grief and however you choose to grief. Your pup loved you very much and I’m sure he was living his best life with you. My 6 year old brother, and best friend had to be put down today. This dog was my heart before I went to the Army, and was my support when I got out. He kept me grounded in the bad days, and saved my life. I knew that even though I need him, he needed me too, and that’s why I had to end his few month fight with cancer, as he was strong like a warrior and would keep pushing on for me. I’m lost now, but I know that when I see him again, we will be complete again. I love you Zulu, thanks so much. 2 months ago my beloved 10 year old cavapoo max had to be put to sleep as he had congestive heart failure & it still feels like I’m just walking away from the vets – the worst day of my life. I just want to be with him & I cry every day, I can’t believe how devastating this feels & i don’t know how to get through the spring & summer without him. We went everywhere together & I am struggling with the awful thought that he’s never coming back. My thoughts are with everyone who is going through pet bereavement. I’m sorry for your loss. You are in my thoughts. Hi Christine. Our beautiful boy Died on Wednesday. He was a 13 year old lab. My wife and I are in pieces. I too struggle with the thought that I am never going to see him again. I get an aching feeling in the pit of my stomach that feels so deep that I feel like I am going to implode. I hope in time the pain eases, but I am sure we will never truly get over the loss. At this time the tears ar difficult to hold back. I have never cried so much. I hope you can find some peace eventually. My dog was in pain and we put him down its really hard to deal with it. I’m so sorry, Tristan. You are in my thoughts. I am having to put my precious 13 and half year old staffie Danny to sleep tomorrow afternoon. He has kidney failure and only showed symptoms 5 days ago. He has not eaten for 3 days and vomits every time he drinks. He can hardly walk. I know I am putting him out of his pain and this is the last act of love I can give him. I am just so dreading after when he not here anymore. We did eberything together and he was my soul mate. I love him so so much and don’t know how I am going to live without my sweet precious boy in my life. I’m so sorry you are going through this. My thoughts are with you. Hi , I am just heart broken , had to put my little jack russel to sleep last week , I just loved him and I feel so guilty , keep looking back at what more I could have done for him , feel that maybe I could have changed things , I know the vet says it was his time , I just don’t feel that , it shouldn’t have been his time , I just loved him , he’s buried in the back garden and I can’t go out there , just want him back .why dose god take something you love so much , feel so sad and lost . I am so sorry for your loss, Gina. I’m sorry, Bharat. You are in my thoughts. I lost my best friend Feb 11, 2019. She was a part of me and I feel lost. It has only been her and I for over 10 years. She almost made it to her 16 birthday. She did everything with me. I took her everywhere I went. I had to make that dreaded decision that just the thought of it I was breaking down. Not getting any easier for me. I still break down every day. I have no family left. Hardest thing I ever had to deal with. I’m sorry, Mark. You are in my thoughts. I’m so sorry for your loss, Jessica. I can understand dear. Its a feeling of guilt and sorrow after losing our lovely pet. May god rest in him peace. I’m so sorry. I feel your pain. I just lost my best friend Lucy suddenly at age 3 1/2. Not only am I lost, the guilt is overwhelming. She ate some of my chocolate I left out in a bowl and I didn’t take her to the vet because I convinced myself she was ok. Within 3 days she went into liver failure and I had to euthanize her. I am devastated. One month and I still cry everyday…he was by best friend, so depressed. I’m so sorry, Dave. You are in my thoughts. I just found out that my dog has cancer and I’m really scared that I’m going to come home and he’s gone,what do I do? I’m so sorry Tristan, have you spoken to your vet about a timeline and your dog’s condition in general? You can learn more about cancer here as well. You and your dog are in my thoughts. Well also,he was only guessed to live to 9, and now he’s 15 and my mom has had him since college and I’m afraid I’m going to come home from school and him be gone. Yeah he has been checked out. I put my dog Vlad to sleep just past midnight today. We were planning on doing it in the morning but he just wasn’t settling down. It was the humane thing to do. He was an old Pom who only took a turn for the worse a few days ago. I’ve had him for half of my life. We both had severe anxiety so he was my constant. I have his blanket and toys on my bed for comfort. My family and I miss him dearly. I’m sorry for your loss, Becca. You are in my thoughts. I understand that because you just don’t want to forget him. I will pray for you Becca. My sweet baby boy Max was ran over on Tuesday, February 12th. He did not suffer which I am thankful for. Max was a rescue chiweenie mix breed and we got him when he was roughly 4- 6 weeks old November of 2017. Max was our little Mexican Hotdog! Max completed our household and was pure joy in our hearts. The pain we feel is horrible and the hole in our hearts is huge. There is sickness in the pit of my stomach that seems to never go away. I just can’t seem to get things right with myself. When I am at work I want to be home, and then when I get home I yearn for his affection. So then I want to be back at work….I am a mess. I just feel so lost without this little guy. Max you stole our hearts from the moment we first laid eyes on you. Have fun playing up above and I look forward to the day we get to see you again. I love you with all heart Max, I miss you little buddy. I am so sorry for your loss, Roxie. Monday February 11, 2019 was our beloved Angel’s last day with us. A very special thank you to our local SPCA for their compassion and help during the most difficult day of our family’s lives. We took Angels sister, Allie, with us to say goodbye. They both came home Christmas Eve 2006 as a present for our daughter. We all were present as Angel took her final breath. The vet allowed us as much time with Angel after the anesthesia as well as after she was given her final moment. Grief does not even begin to describe the pain, emptiness, and sorrow we all feel. Angels, best companion and sister Allie did sniff her after she passed. She knows and she is sad too. Always knew there would be a time to say goodbye but didn’t think it would come so fast. Angel, you gave us 12 wonderful years girl. You were beyond smart. We will forever miss you, your communication, and your beautiful personality. I’m sorry baby that we had to let you go. LOVE YOU SO MUCH! I’m so sorry for your loss, Donna. Your family is in my thoughts. I had to say Good bye to Mylie, my 7 year old Yorkie. I am still in Shock. It was totally unexpected. I held her in my arms and talked to her, Prayed for her and thanked her for all the Love, Laughs and Joy she brought to my life. I don’t have children so my two Yorkies were my babies. They helped me get through the loss of my Mother and only brother. Cinamin and I are helping each other get through. The next hurdle will be picking up her remains from our Vet. I’m sorry for your loss, Keith. Grief is different for everyone. A part of you will likely always miss her but you may learn to manage those feelings better as time passes. You are in my thoughts. Our sweet one eyed Addie crossed to the Rainbow Bridge yesterday morning. There is such an absence. Thoughts swell and tears come. I know time will help and memories twill take over but now it is devastating to be without her.